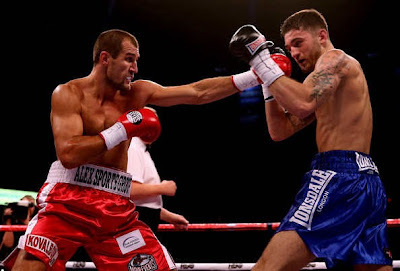 Boxing fans will be in shocking mode if they will see the video replay and highlights of Brit Nathan Cleverly vs the Russian Sergey Kovalev in a WBO light heavyweight match up. The video replay highlights is now available but the fight results taste bitter for the boxing fans who watch it live in the defending Champion's territory. Not all host country will win all the time, this happened to Gilas Pilipinas who lost to Iran on FIBA Asia 2013 and to a Filipino boxer AJ Banal who badly lost Thai Sor Sinyu in both Championship match. But both visitors won the championship match - Iran became the FIBA Asia 2013 Championships and also to the Thai Sor Singyu who defeated AJ Banal to win the WBO Bantamweight title. Coming into this fight, both boxers are undefeated in their entire boxing career. Cleverly has 26 wins and Kovalev has 22 wins. It was the 6th WBO title defense for Nathan in his hometown of UK while the visiting US based Russian Kovalev is a hungry fighter who has his first world title crack coming into this fight. He is the challenger of this fight who is has the slight disadvantage coming into this fight - fighting outside territory and in opponent's hometown. Also his confidence is an issue here because this is his first time challenging the world champion. All he has to do is giving his best by absolutely knocking out the champion. Guess what? Segey Kovalev became the first boxer ever to defeat Nathan Cleverly for the first time. He stopped the champion in the eyes of Cleverly's hometown boxing fans. Cleverly lost his WBO light heavyweight title in his 6th title defense via 4th round technical knockout by the visiting boxer. Segey Kovalev became the new WBO light heavyweight champion of the world. Congratulations to the new Champ! To the former champ, maybe this is not your night, hoping to come back stronger than ever as you learn from this defeat in front of your people. Watch the Video Replay Highlights. As boxing fans, what's your thoughts about this fight?